I used to think my dance lessons were all about timing, steps, musicality, and technique. Lately I have come to realize that that there’s more too it than that. The more I dance, the more I learn about life. According to my teachers – dance is life. And nowhere was this more apparent than on my recent trip to New Orleans where I managed to squeeze in a two-hour tango lesson with the very elegant, “man in black” – Alberto Paz. He was gracious and patient, and I immediately felt at ease with him despite the usual stage fright I feel whenever I dance with someone for the fist time. Alberto was surprisingly complimentary at what little technique I had managed to pick up in Buenos Aires. (Ah, me of little faith.) He liked working with beginners, he explained, because there were few bad habits to correct. “Catherine,” he said. “It’s a compliment so take it and just say thank you,” he said. I decided that the next time someone paid me a compliment, I would own it. As naive as it sounds, it came as such a revelation that I actually asked Alberto if I could write that piece of wisdom down before I forgot it. He laughed, put his arm around my shoulders, and gave them an affectionate squeeze . “But you already knew that!” he said. Lesson #3: “Dance is like life, It’s about how you feel and not how someone else makes you feel. Probably the hardest lesson of all was just learning to slow down. 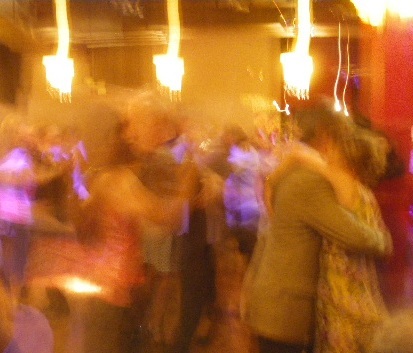 Tango, more so than any other dance, requires the dancer to be in the moment, wait, and savor each step. However, I sometimes I approach tango as something “to do” rather than something “to dance.” I want to make sure I do all of the steps whether I enjoy them or not. Lesson #4: “Dance is like life. Make every step count! Thank you Vamp for featuring my post as your “Read of The Day”. You made my day! I have never met Alberto, but we correspond with each other and I adore him. He is also very funny. I am glad that you had a chance to meet him. Alberto works very hard to educate people about Tango and the music. I loved your story. It was thanks to you Arlene for making the connection prior to my trip. I hope you do meet him…he’s a lovely person. Thank you again! Will keep you posted on any upcoming trips your way. Eso! You have a beautiful way of writing. Very soothing, uplifting and inspiring! Thank you Linda for your kind words. I really appreciate it! Every so often I wonder where your ship is heading now, or where it may be anchored, and I wish that your life is full of excitement and rewards, indeed I wonder.